On the 18th of April, ANA HUNNA International Network, the International Development Support and Consulting (IDSC) and Ahead of the Curve (ATC), held the launching event of the local network in KMT House in Cairo. The local network and its partners shed light on ANA HUNNA’s history and activities in the region. The event started with a key note speech from Mr. Sebastian Wilde, first Secretary at the German Development Cooperation in Egypt, followed by a word on GIZ gender-inclusive activities in Egypt by Mrs. Manuela Oettinger GIZ Egypt Portfolio Manager, and wrapping up with a word from EconoWin’s programme director, Mrs. Hildegard Vogelmann, introducing the ANA HUNNA local network partners. 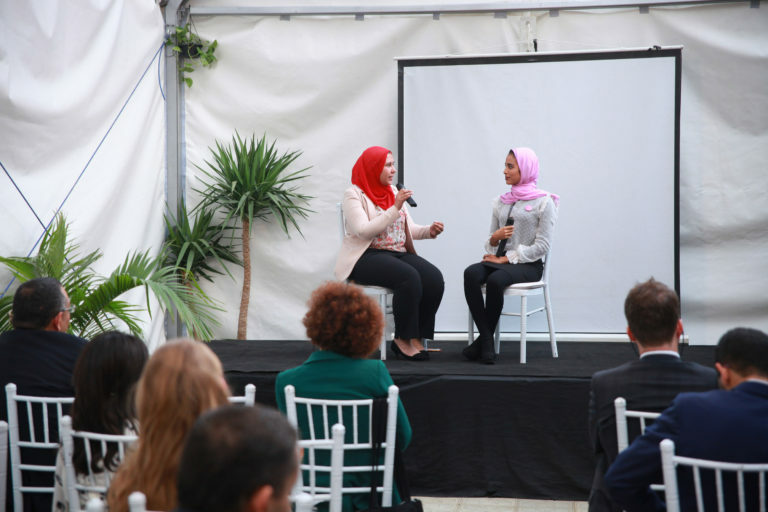 Ms. Alaa Ragab; a 21-year-old female graduate of a TVET school in Aswan, was invited to talk about her experience starting her own events’ planning business in her local community after she received a training on ANA HUNNA tools and approaches two years ago. During her interview, she discussed how ANA HUNNA inspired and empowered her through real-life examples of successful women. A panel discussion on the topic of “future prospective of women and work in Egypt” was organized. Representatives from private sector, NGOs and the ILO gave their input towards the challenges that women face in advancing their economic rights in Egypt and how the ANA HUNNA local network can help in offering creative solutions. At the end of the event a photo-walk was prepared to showcase ANA HUNNA’s successful stories from its history and give an idea about the regional activities.